There are many reasons why it may be time to replace the caulking on your bathtub. Perhaps the caulking is turning a brown shade or it is cracking. Whatever the case may be, all of these situations can lead to water damage, mold growth and even structural problems. The good news is that caulking is very inexpensive and also easy to replace. 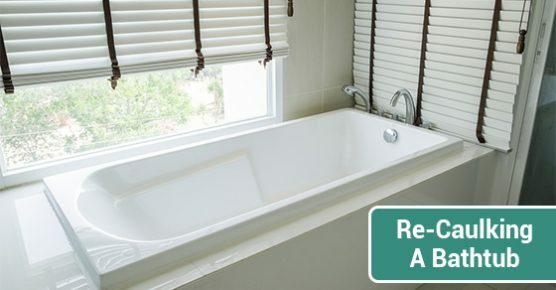 The best caulking, whether for bathtubs, sinks or shower stalls, comes in tubes with the label “Tub and Tile” or “Kitchen and Bath.” These types of caulking are particularly ideal because they will be made of either 100% silicon or silicone compounds that are formulated to prevent mildew from growing. To remove the current caulking, you can use any of a number of tools to get the job done, so just use whatever you already have at home. You can use a putty knife or a 5 in 1 painter’s tool and a razor scraper. Another option is to use a plastic utility knife (one with a metal blade will scratch plastic tubs). You can also use a caulk softener to help make the process move along a little quicker. Use a small vacuum to get rid of any debris. Next, take a damp cloth (or a piece of paper towel with rubbing alcohol) and run it over the bathtub to remove any remaining traces of caulk dust. Ensure that you dry this area very thoroughly, so that the caulk has a smooth, dry surface to bind to. Take blue painter’s tape and lay two parallel strips with three-eighths of an inch of space in between them. This is where the caulk will go. Next, apply steady pressure to the gun as you move slowly along the length of the tape. It is important to keep the gun moving at a steady rate; if you go to fast, the bead will be too thin and bubbles could form in the seal. Use a wet finger (or a piece of paper towel or a lint-free rag that is dampened) and press it along the length of the caulk. This will help to flatten any globs that have appeared during the process. Next, remove the tape one strip at a time, then smooth the bead again. Lastly, wait 24 hours before using the shower or bathtub. If you are in need of a professional plumber, contact Advanced Plumbing today. We offer quick, around-the-clock services.